I’ve been on a bit of a zucchini kick lately. Justifiably so, I think, since zucchini is in season and it’s cheap, not to mention really good for you, delicious, yadda yadda yadda. A few weeks ago I was able to disguise it in cake and Kat was none the wiser. She ate it voraciously, willingly, happily. But this time it wasn’t nearly so inconspicuous and she poo-poo’ed it, despite the fact it’s made with pizza dough and smothered with cheese. Really, what’s not to like? I’d had this recipe tacked on my office bulletin board for a few months and knew it would be good (need I mention carbs and cheese, again?). But it’s not one of those things you can just whip up unless you’re serving at least six. I was pretty well guilt-ridden after one slice. It’s probably best served at a party (think your book club meeting or a game day party, i.e. Michigan State v. Notre Dame this weekend), where you can have that one guilt-inducing slice, but when you go back for seconds it’ll all be gone. Thaw frozen pizza and let rise per directions on package. Preheat oven to 400°F. Line baking sheet w/parchment paper; spray with nonstick spray. Roll out dough on parchment paper to about 12 inches. Spread half of herb cheese over 1 long half of dough, leaving 1/2 inch border. Sprinkle with half the parmesan and 2 tablespoons parsley. Using parchment as aid, fold plain half of dough over filled half (do not seal edges). Spread remaining herb cheese over top; sprinkle with remaining parmesan. Remove enough outer layers of onion to yield 2 inch diameter core; cut into 1/8 inch rounds. 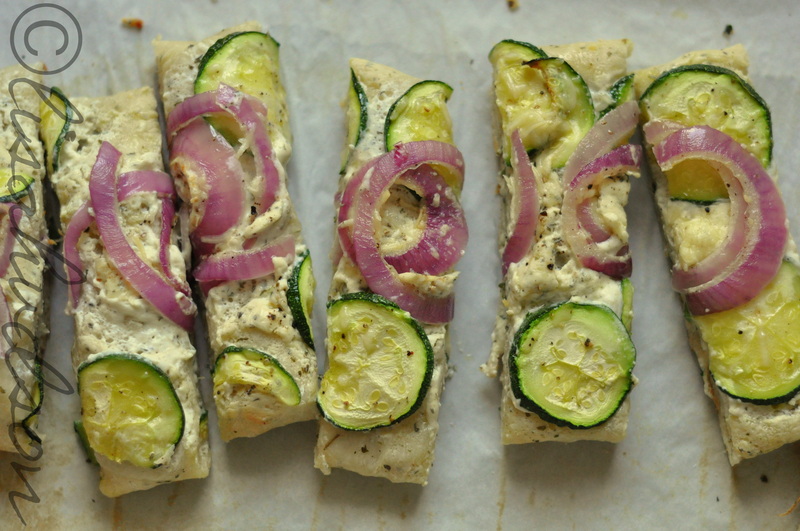 Arrange 1 row of zucchini down each long side of dough. Arrange onion rounds in row on top of the zucchini. Brush vegetables with oil; sprinkle with salt and pepper. Bake bread until puffed and golden brown at edges, about 24 minutes. This recipe is also posted at Balancing Beauty and Bedlam, Tuesdays at the Table . Click over to those blogs for lots of other recipes on this Tasty Tuesday. Such beautiful pictures! Wish I could take them so good…any tips? My camera is decent. What a great, quick recipe. I think zucchini is one of the best veggies/fruits! Thank you, ladies. I think I’m mildly obsessed with it at the moment. 🙂 Jennifer, are you shooting with DSLR? Also, for most food photography I use a 50mm lens, which produces great DOF and shoots well in low light (not that I have much of that out here in the desert). What kind of camera are you using? Thanks so much for reading and the comments. I appreciate the feedback. Just going back in your archives to see all your yummy recipes. We have very similar tastes in food because everything looks fantastic! This looks fabulous! Thanks for sharing!